Versatility has no secret for the Ford Escape. It offers all the utility a capability an SUV can provide in an accessible and fun-to-drive format. Here’s an overview of the 2018 Ford Escape. Things have changed since the model was introduced at the turn of the millennium. From a rugged, more primal sports utility vehicle, the Escape has evolved into a modern jack-of-all-trades. The thoroughly revised third generation was introduced in 2013, a winning platform carried over for 2018. If four years might sound like a long time ago, the model has since been upgraded, including a notable facelift for 2017. 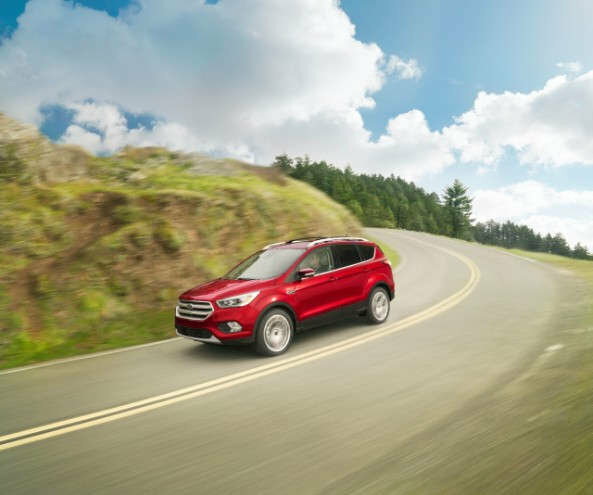 From a sedan-looking front-end, the Escape regained some muscle thanks to a sophisticated yet sculpted hood and grille. Headlight and taillight designs have been adapted to fit the model’s new image thanks to a more elaborate shape. In 2018, the design fresh off the drawing table remains untouched - why change a good thing after all? All three powertrains introduced last year also remain available. The naturally aspirated 2.5-liter engine remains the entry-level offering, available only in a front-wheel-drive layout. Intelligent four-wheel drive is optional on both the 1.5-liter and 2.0-liter EcoBoost turbocharged engines. If you thought an SUV can’t be fun to drive, think again. The pair of EcoBoost engines are anything but boring and it adds plenty of spirit to the drive, should the driver decide to take advantage of it. A six-speed automatic transmission is standard across all trim levels. A lot of new technology has been thrown into the updated vehicle which now features systems such as lane-keeping assist, adaptive cruise control with forward collision warning and brake assist, cross traffic alert, and a backup camera. Other available features include panoramic Vista Roof, 110V power outlet, wheel-mounted controls, SYNC 3 with voice-activated navigation, satellite radio, dual-zone temperature control and heated front seats. For added utility, a trailer tow package can be added to the vehicle, allowing for the Escape to tow a charge of up to 3,500 lb. Combined with the model’s generous 1,925-liter cargo volume accessible via the foot-activated, automatic liftgate, there’s no challenge too big for the Escape. But what’s utility if there’s no space for the passengers? This is not a sacrifice the Escape has had to make as it provides ample room for front and back passengers with plenty of small storage compartments and cup holders to boot. The 2018 Ford Escape is now in the showroom at Bruce Ford. Visit us for further information about the model, to have some sitting time onboard and to get acquainted with one of the best compact SUVs on the market.